Alright, I'm gonna go all Boyd Matson on y'all for a minute here and talk about wildlife. Well, maybe not wildlife in the true sense of the word but whatever... Check out the real king of the jungle, the biggest and the baddest: the liger! Supposedly the result of an accidental hybridization of a male lion and a female tiger at the Institute of Greatly Endangered and Rare Species in Miami, a liger was born. According to the owner of the institute "ligers are not something we planned on having, we have lions and tigers living together in large enclosures and at first we had no idea how well one of the lion boys was getting along with a tiger girl, then lo and behold we had a liger". I don't think it's ethical to cross different species, and I'm not sure whether to believe that a professional, experienced animal trainer and zoo-keeper would let something like this happen by accident, but still the result is pretty amazing. A visit to Miami is not gonna happen for me in the near future, but word on the street is that a liger resides on Germany soil. 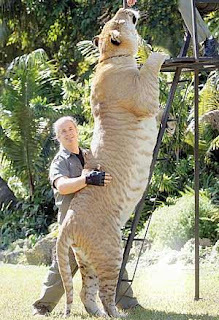 As soon as my sources are able to confirm this, I will make it my goal for 2010 to track down the German liger and see it with my own eyes. Check out some interesting footage of ligers here and here.